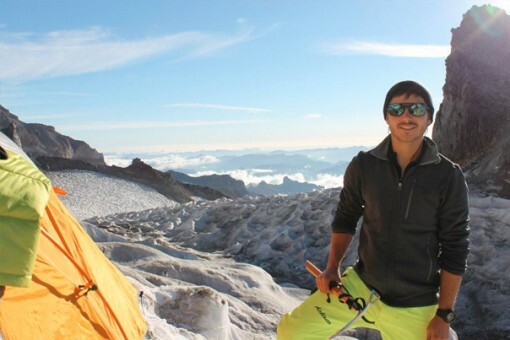 Back in 2011 adventurist Jonathan Ronzio began working on a project, Between The Peaks, which took him climbing and volunteering throughout the Americas. He turned that adventure into an award-winning film about following your dreams while making a difference, and is still traveling with intent to inspire. I moved around a whole lot as a kid. For the first 10 years of my life I bounced around from Illinois, to North Carolina, to Florida, and then Massachusetts, but I would say I really grew up in the Boston area. Throughout my childhood I was fortunate to go on a family vacation almost every summer. We would go to Orlando, Kauai, St. Kitts, or California, to name a few spots, and I definitely caught the travel bug pretty early on. Travel was always something I looked forward to and I could never wait for the next trip! The first time I really set out on a big trip on my own though, was in 2009. I took off and spent 5 months studying abroad in New Zealand. My days were filled with hiking, surfing, snowboarding, camping, rafting, skydiving, bungy jumping, hitch-hiking, you name it—there was nothing better than wandering the South Island with nothing but wide eyes and an appetite for adrenaline! 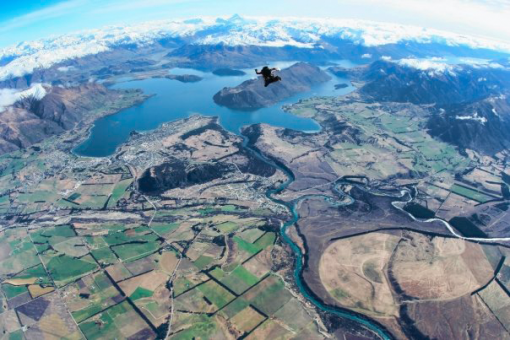 Ronzio Skydiving over Lake Wanaka in New Zealand. Out of all your adventurous experiences, which is your favorite? Tell me a bit about it! I’ve had a lot of really unbelievable adventures, but my Between The Peaks expedition has to be the one that stands out above the rest. 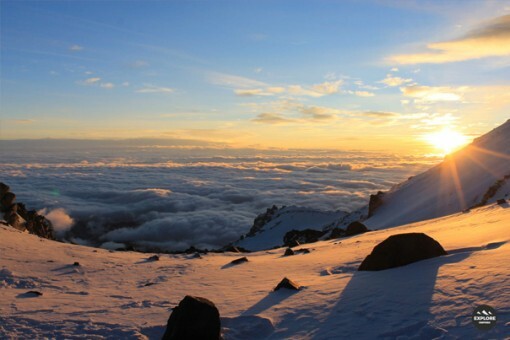 I came up with this crazy idea to climb the tallest mountain in South America and then travel north from there volunteering in every passing country until ending up at the tallest mountain in North America. My friends and I spent two years planning and training for this trip and just after New Year’s 2013 we left on one-way tickets for Santiago, Chile. We spent five days figuring out how to buy a car there, and then hit the road to climb Aconcagua and head north up the Pan-American. That four month voyage along the roadsides of South and Central America, through deserts, jungles, mountains, and more, is gonna be hard to top! 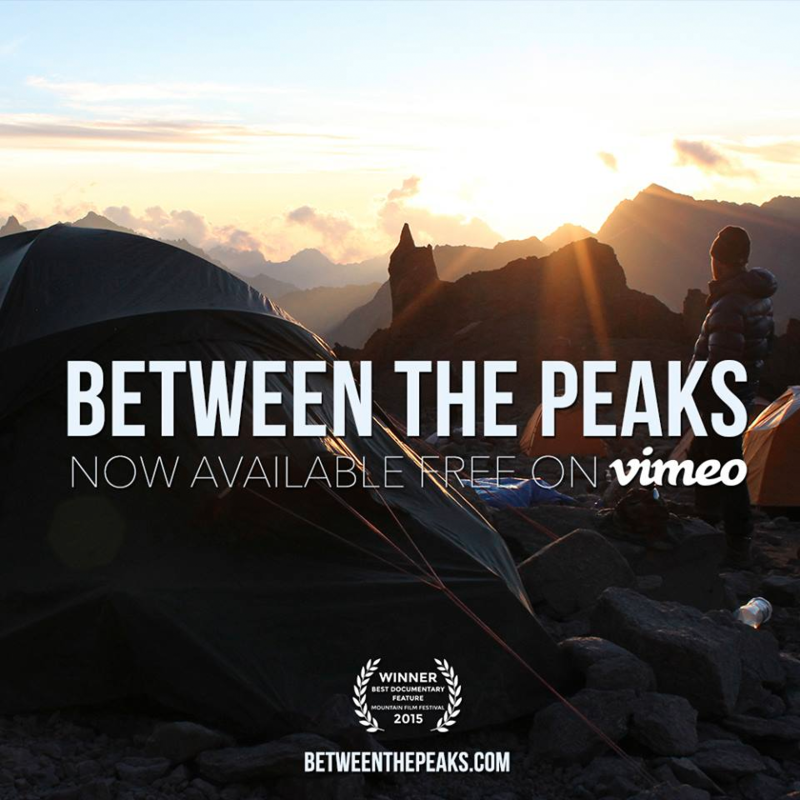 Between The Peaks film promo – 16,108′ on Mt. Aconcagua. Why did you begin writing about your adventures and when did you start? I actually used to hate writing. I wasn’t a great writer as a kid and I have no idea where or when the switch happened but it’s funny that I get paid to write now! There have been so many times I’ve tried to keep a journal while traveling, or just for life in general, and I am just horrible at keeping up with it. I could write song lyrics, but not journal posts. For that reason, I was super hesitant to start any sort of blog. It made sense that I should have a lot to write about, but I just never had the motivation to start. But I have to give the credit to one of my roommates from my year spent in Aspen. Dan Andrews, of Well-Rounded Success, kept prodding and encouraging me to write. I sat on my first blog post for probably three months before refining, deciding to build a site, and publish. And things have steamrolled from there! 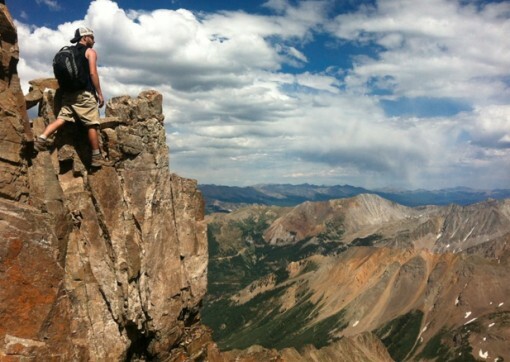 Ronzio on Colorado’s Castle Peak ridge line. What’s the meaning behind your website’s name, Explore Inspired? To explore, and see what’s around the corner, over the mountain, or under the water, that’s one of the most addicting of life’s quests. There’s no doubt a lot of us embrace the explorer’s mentality, probably not enough, but a lot. And Explore Inspired is meant to gather stories of the people, places, and ideas that inspire us to get out there, off our asses, and see the world in new ways. It might be a round up tips for the digital nomad, the best spots to stargaze in Chile, or more personal stories from me, or about others. Really, Explore Inspired is just that. A place to get you inspired not just to explore more, but to explore with greater purpose. Mt. Aconcagua sunrise, just over 20,000′, taken by Ronzio during the Between The Peaks summit bid. What was your life like before you became a worldly explorer? Before I really got into climbing and adventure travel, I was pretty focused on playing music and working with my brother to build a video production company. He had started EVC at 14, when I was 11, and so of course I grew up learning from and working with him. With Chris at the helm, the small team of us took the company from our basement to being one of the nation’s largest event video production companies for amateur sporting events. Of course, that allotted plenty of opportunity to travel as well. 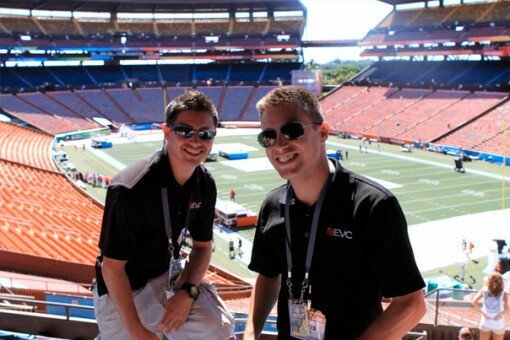 Jonathan and Chris Ronzio in Hawaii to film the 2011 Pro Bowl Halftime Show. And in regards to the music, playing guitar, singing, and writing songs have always been incredible passions of mine. I bought a guitar and taught myself how to play in sixth grade. Throughout high school and college I would play out at a lot of different shows but in the past years with adventure travel really taking the driver seat in my life, it’s been tough to continue to play and record consistently and build a solid audience anywhere. In August though, I did release a new single called “Smoke Signals” and that’s available on Explore Inspired now and a music video is releasing this month. I’ve read that you volunteered while traveling — what was that like? Why did you choose to do so? Volunteering while traveling is 100% the most rewarding thing you can do and one of the most genuine ways to experience the culture, people, food, and attitudes of a new place. I remember as a kid when the wooded lot next to our house was going to be developed and built on, there was this gigantic boulder I loved to climb. As a 10-year-old I sat on that rock in protest hoping they wouldn’t fill the lot with dirt and cover it up. But, I had to go to school, the rock was covered, the house was built. I was heartbroken. I’ve always felt the urge to help protect amazing places and help people whenever I can, so I guess that spirit, combined with studying environmental science, manifested in a desire to volunteer as a way of traveling and experiencing the Americas. My friends and I worked at a wild animal rescue center in Ecuador, on a school and coffee plantation in Honduras, and with a habitat restoration project in Chile, among many others. Every experience was unique, every experience was beautiful, and every experience was well worth the time, effort, sweat, and dirt that we traded for friends, memories, and new world views. 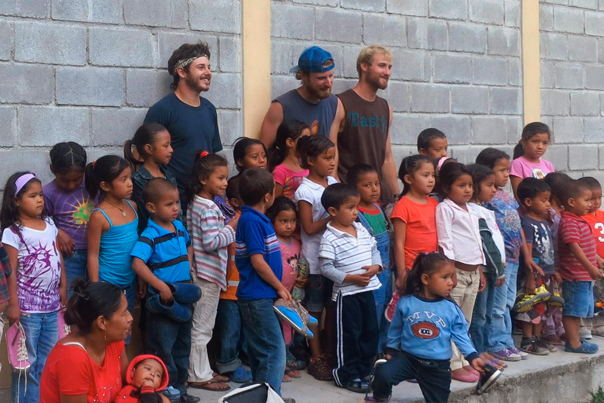 Ronzio and team just after giving away 50 pairs of Keen’s to children in Zambrano, Honduras. I see you’re into film. How does it play a part in your traveling and writing? I love video as a medium to tell stories. I think it’s incredible powerful, visceral, and motivational when done right, and I do have a background in video production which is definitely a huge benefit to building a career around adventure travel. I will bring the camera and film a lot when I go, but I’m not making a polished short film of every adventure I take. Those one off videos of little trips aren’t what I want to put the effort into. I’d rather write about the small trips. Maybe that’ll change down the road, but right now as far as video goes I’m more focused on projects like Between The Peaks. Coming up with some crazy concept that could take years to plan or months to pull off, and that has some unique defining meaning in the story. Not just, “Hey I’m cool ’cause I travel” videos because there’s a million of those already. 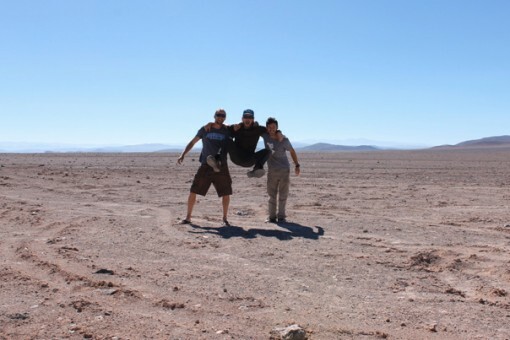 Ryan Sarka, Ethan Lee, and Jonathan Ronzio of Between The Peaks, in the Atacama Desert, Chile. Is it difficult to support yourself financially? It can be, yes. For Between The Peaks, we had sponsors help with gear and promotion, but the travel and filming expenses all fell onto our shoulders. The three of us came back with some serious debt (and a lot of credit card points!). It was totally worth it, but that was a big hole to dig out of. Travel can be very expensive or very cheap depending on the activities you’re pursuing and I guess in recent years I’ve just pursued the ones that require a huge investment of equipment, like snowboard mountaineering. Ronzio nearing the summit of Mt. 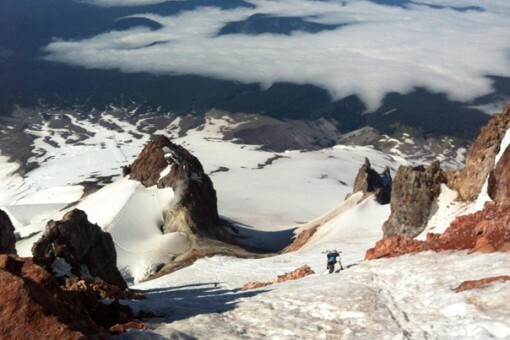 Hood, Oregon for a July snowboard descent. Right now, I’m not making a living solely on the travel side of things. My brother and I run an entrepreneurial adventure retreat, I work with clients as a content marketing consultant helping them to connect with and build their audiences through great content and social media strategy, and I even launched a brand of coffee last year. How has traveling shaped your life? In every way imaginable really. Not to be intentionally short here, but if I’m not I’d be writing a novel! The experiences I’ve had, knowledge and perspectives I’ve gained, friends I’ve made around the world, it’s just unbelievable to think about how many doors and ideas have been opened by travel. And probably most purely at the core level, the confidence I’ve developed to believe in my pursuits and be capably independent, it’s all a direct result of getting outside of the bubble of comfort and routine and just embracing what comes next. Ronzio on the Cowlitz Glacier on Mt. Rainier, Washington. Do you have any advice you’d like to share for adventurers looking to make a living out of experiencing the world? I would say you need to first experience the world, before you start thinking about how to make a living doing it. Don’t just jump into wanting to be a travel writer or TV personality because Anthony Bourdain looks like he has a lot of fun and you like the idea of travel. Get your exploratory feet wet and have a few solid trips under your belt where you don’t have to think about making deadlines on a story, or worrying about what you did or didn’t take a picture of. Just go, see, and do, be free and find your way. After that you’ll have made a stronger foundation for the snowball you hope you keep rolling, and as that snowball of passion grows, don’t wait to be handed anything. Create the opportunities you desire! 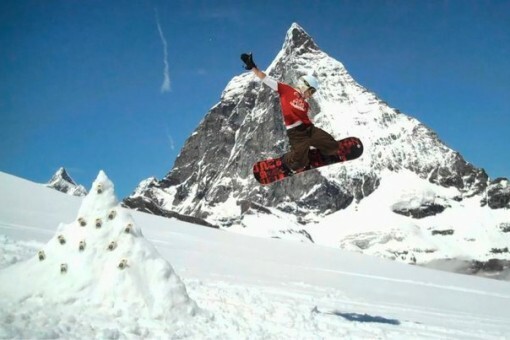 Ronzio on a snowboard adventure trip to promote Old Spice Matterhorn in Zermatt, Switzerland. 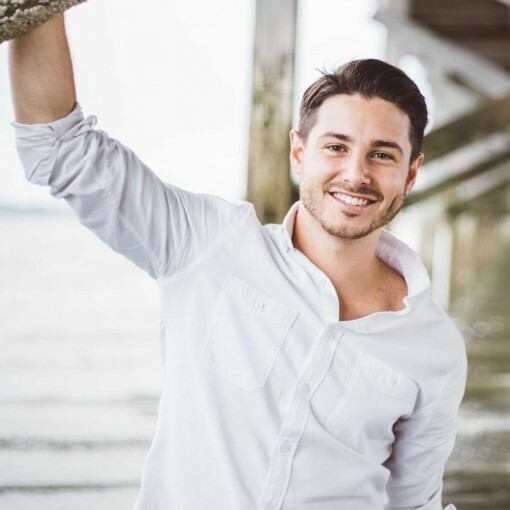 Jonathan Ronzio is an adventurist, entrepreneur, writer and speaker. He is the Director of the award-winning adventure documentary Between The Peaks, and creator of the Explore Inspired adventure travel blog.